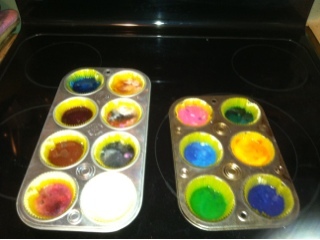 Always Think Bigger: Project 1: Melted Crayons...Pinterest made me do it! 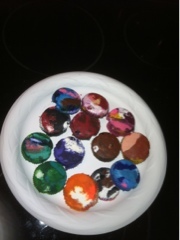 Project 1: Melted Crayons...Pinterest made me do it! I have often wanted to try this project. I have seen dozens of similar pins about it and I thought it would be a fun and simple way to get started trying all these pins that I have. This past saturday I wanted to start with something that I have seen over and over and that I thought would most likely be easier to do. 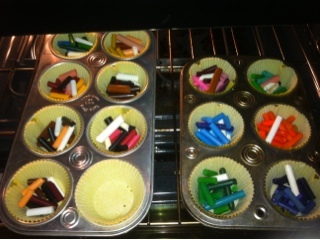 Broken crayons seem to be all over my house, which made this project seem to be a great way to get them out of here! Doesn't it seem that with kids we have broken crayons everywhere?!? Obviously, before I could get started, I had to peel all the paper off of the crayons. This is definitely a great activity for kids, as this was INCREDIBLY time consuming for me.Next up, of course, put them in the oven and wait. 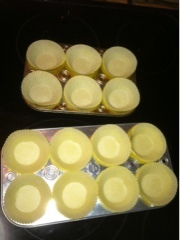 Once they go in, it is important that you turn them in the oven, if you would normally turn your cakes or casseroles. If your oven cooks evenly, then you don't have to worry about it. But don't forget they're in there! When they come out they'll look like a mess. I mean this. 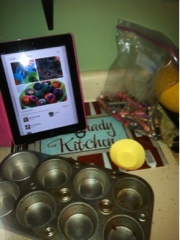 After you let them cool, you can pull the cups out of the cupcake tins and put the crayons on a plate. Give them at least a good hour or two to cool off before you put them in something else, like a baggie or rubbermaid, that way they cool off all the way and don't stick together. Once I knew they had cooled off enough I gave them to Lissy to color. All-in-all, the activity was a lot of fun! 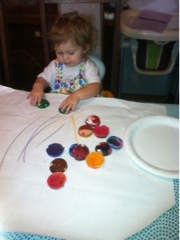 I really enjoyed getting to play mad-scientist and Lissy seemed to really enjoy having big crayons to color with!